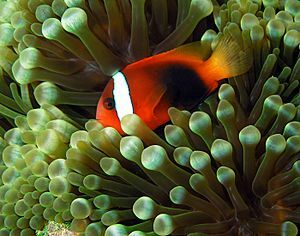 Amphiprion melanopus anemonefish in a bubble anemone from East Timor. The anemones have an oral disk on the top of its body. The sea anemone’s head is in the middle of the oral disk. The tentacles surround the oral disk. The pedal disc is on the bottom of the sea anemone. 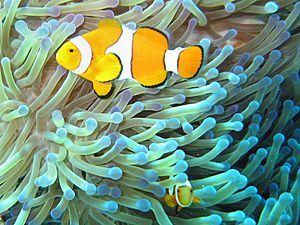 Some sea anemones live in symbiosis with other animals. Clownfish, Bucchich's goby, and Sipder crabs find shelter among the tentacles of the anemone. Hermit crabs often have sea anemones on the shell they inhabit. Sea anemone Facts for Kids. Kiddle Encyclopedia.